The chairman of Reading Football Club has been appointed the new chancellor of the town's university. 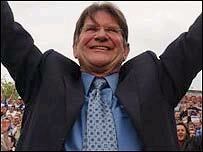 John Madejski, 66, will be formally installed as the seventh chancellor in December, it has been announced. Mr Madejski succeeds Lord Carrington, who was appointed the university's chancellor in March 1992. The Premiership club chairman said he was "honoured", adding: "I look forward to promoting this well-respected educational institution." It is the latest honour for Mr Madejski, who was appointed OBE in 2000 and was made freeman of the town after leading his team, the Royals, to the Premiership for the first time in their 135-year history. Mr Madejski, who took over as club chairman in 1990, is also a benefactor of the Royal Academy of Arts and has a gallery named after him at the Museum of Reading. Prof Gordon Marshall, the university's vice-chancellor, said of Mr Madejski: "He has an international reputation for his business achievements and has given much to the town through Reading FC, as well as giving much to the county of Berkshire though various business, educational and arts projects." The first chancellor of Reading was JH Benyon, who held the post from 1926 until 1935.